The Middle Tennessee AgResearch and Education Center is composed of six different units in the greater Knoxville area. It facilitates numerous and diverse research projects for UTIA faculty. Here are a few extra facts about ETREC. 1) It’s the site of the 'Live and Learn' internship for CASNR undergraduate students. - Students majoring in any CASNR academic major are eligible to apply for this internship program. Live and Learn interns have the opportunity to live in an ETREC residence in exchange for twelve hours of work per week on the ETREC research units. Among many other tasks, interns are involved in cattle management, organic vegetable production, and agronomic research plots, just to name a few. This provides the interns with valuable insight into the diverse nature of the agricultural industry and into the unique mission, aspects, and procedures of agricultural research. 2) They’re saving salamanders. - AgResearch is heavily involved in an effort to learn more about a fungal pathogen that is harming salamanders in Europe and, potentially, North America. Researchers say we must act to protect the global amphibian biodiversity is at risk. Salamanders are key players in a variety of ecosystems, serving as predators for many insect species, including some that can affect human health. They are even thought to play a role in carbon cycling and buffering climate change. 3) Many of the research trials for UTIA’s Soybean Breeding Program happen here. - Scientists use these trial results to breed for increased yield, disease tolerance, enhanced protein quality, and modified fatty acid composition for improved human and animal nutrition. ETREC is especially proud of the soybean breeding team for the development and release of the 'Ellis' soybean variety. This variety is especially noteworthy to ETREC staff because it is named after Lee and Debbie Ellis. Lee was a longtime research associate at ETREC, and his wife, Debbie, worked for many years as a key contributor to the soybean team. ‘Ellis’ was adopted as the USDA high-performing yield check in 2014. 4) ETREC research is identifying viable biobased crops. - The Center for Renewable Carbon has worked with industry and academic collaborators to conduct a very interesting field trial with hybrid poplar trees at ETREC and other locations across the southeastern United States. These genetically improved trees reached thirty feet in just four years, and a recent harvest produced more than 6 tons/acre of woody biomass. The ultimate goal of the research is to help scientists progress further down the path toward low-cost, high-quality biomass. 5) They’re finding grazing alternatives for cattle producers. 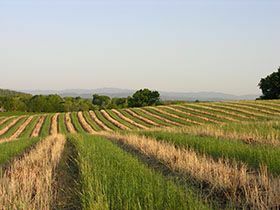 - Tall fescue is the predominant grass grown for pasture and hay production in Tennessee, but cattle producers need grazing alternatives during the hot summer when tall fescue performs poorly. AgResearch scientists are utilizing ETREC to study native warm-season perennial grasses (NWSG), such as indiangrass, big bluestem and little bluestem, as summer alternatives to tall fescue. Preliminary results reveal steer gains of approximately 2.0 pounds per day when grazing NWSGs during the summer, a substantial improvement over cool-season grasses during this same period. If producers can establish NWSGs on 10-30% of their pasture for summer grazing, overall productivity and profitability could potentially be increased. In addition to evaluating cattle gains, a current study is also monitoring habitat and populations of grasslands wildlife, many species of which have experienced long-term population declines in the NWSG pastures. East Tennessee Angus Association and UT Angus Production Sale (ETREC cattle)—Saturday, March 19, 2016, at Brehm Arena on UT agricultural campus in Knoxville. Sale starts at noon EDT. See sale catalog.